Allen Diesels’ engines are designed to provide customers with the best value for their investment. Considerably more than half of Allen diesel engines installed in the 1960s are still fully operational today in a wide variety of locations and applications. 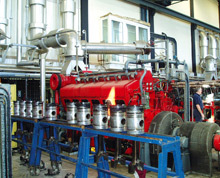 These engines include pumping sets and one installation in the UK is outlined below. Southern Water’s Eastney Pumping Station is situated in Portsmouth, a city of 200,000 people on the south coast of England. Two James Watt engines, each of 300 horsepower, powered the original Victorian facility but in the 1960s as the station was no longer large enough to cope with the increase in demand due to the rise in the local population, additional power was required. Among the equipment selected for the upgrade were six Allen S12 diesel engines – two in-line 6BCS12-C engines and four vee 12VBCS12-C engines. The diesel engines were selected to drive the storm water pumps. This avoided the high maximum demand charges for electricity, which would have been incurred by the use of motor driven pumps, and utilised a different energy source. The reliability of the normal public electricity supply was not in question. Most of the auxiliaries essential to the operation of the engines are motor driven or electronically controlled, and it has, therefore, been arranged for all the plant to shut down automatically should the mains supply fail. A separate stand-by diesel alternator set is then brought into operation and the diesel driven storm water pumps and auxiliaries can be restarted. 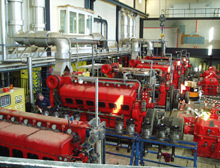 The Allen S12 engines at Eastney Pumping Station were installed in 1966. These engines have established a strong and deserved reputation for robust reliability and economy in a variety of applications using a variety of fuels. The pumping station continues to be predominantly used for pumping storm water out to sea at appropriate tidal conditions. The station is also used for pumping sewage. During their operation these engines have proved their durability when they were completely submerged by storm water in 2000. Southern Water have requested the major overhaul of all engines in order that they can provide a further 25 years service to the people of Portsmouth, by which time they will have been in service for well over 60 years. To see the Scope of work undertaken at Eastney Pumping Station click here for the PDF.